Akshay Kumar’s upcoming film, Rustom, is releasing on August 12 and the trailer has got the audience pretty intrigued. Rustom is based on real-life events that transpired in Mumbai (then Bombay) in 1959. The movie is about a Naval officer who ends up killing his wife’s lover. The real life case set a lot of benchmarks back in the day and was the last case that was tried under the jury trial method. It was one of the first cases of independent India where the media took over the role of moral police and the masses swayed with it. 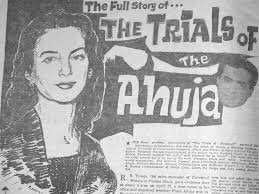 Interestingly, Rustom is not the first film that is being made on the infamous case. In 1963, Yeh Rastey Hain Pyar Ke, starring Sunil Dutt, was loosely based on the events of this case. The 1973 film, Achanak, starring Vinod Khanna and directed by Gulzar was also inspired by this case. But what is it about this case that has kept Bollywood so hooked? The answer lies in the events that took place from 1959 -1961. Commander K.M. Nanavati was tried for killing his wife’s lover in 1959. K.M. Nanavati was a Commander with the Indian Navy and had settled in Bombay with his English wife, Sylvia and three children. Nanavati was often travelling because of the nature of his job. It was during his absence that his wife had an affair with Nanavati’s friend, Prem Ahuja. In 1959, when Nanavati returned after one of his assignments, he could sense that something was bothering Sylvia. When he asked her, she confessed about the affair. He had earlier promised his wife and children that they would go to the movies, so he dropped them at Metro cinema but did not join them. He went to Prem Ahuja’s residence and confronted him. Nanavati asked Prem if he was going to marry his wife and take responsibility of the children. When Prem refused, Nanavati shot Prem thrice with his service revolver which resulted in his death. Nanavati later went to the police and surrendered himself. When the case went to trial, India was still following the jury trial method; which means that a bench of regular people heard the case along with the judge and would rule the accused as guilty or not guilty. The main argument in the court was whether Nanavati shot Prem in the “heat of the moment” or whether it was a premeditated murder. In the first scenario, he would get a maximum imprisonment of 10 years but in the second scenario, he would be sentenced with death or life imprisonment. Nanavati’s lawyers argued that he shot Prem in the heat of the moment. Nanavati was a patriotic man who had been honestly serving his country and he pleaded not guilty. 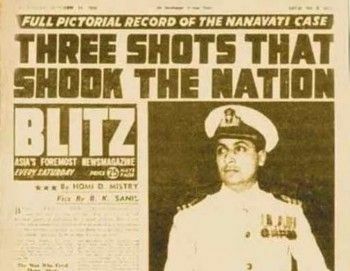 The case had become a huge media frenzy as the weekly tabloid, Blitz, had openly declared its support for Nanavati. They constantly championed him as the man who had committed a mistake in the moment. This resulted in Nanavati getting a lot of support from the general public.